As spotted by ITV’s Clive Tyldesley, I think, during the commentary on one of Arsenal’s Champions League matches this season. Very unimpressive. 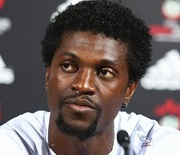 There is a much more apt look-alike for Adebayor, namely the First Lady of the United States. It is also much funnier, as he is a fellow and she is a gal, or lady.